We, the signatories to this contribution to the consultation, are senior archaeologists who have carried out internationally recognised research within the Stonehenge WHS within the last ten years or more. Most of us are employed by UK universities; many were employees of various universities or of English Heritage when doing that research. Together, we have been responsible for many of the major discoveries of recent times. We ask this submission be noted with the respect due to the large group of proven experts who have compiled it. This text has been jointly written; it represents our shared collective view. Until now there has been no effective consultation with us, the wider community of archaeologists studying the Stonehenge landscape. So the opportunity has so far been missed to incorporate into the plans for the A303 our great, fast-growing and fast-changing knowledge of archaeology in and around the World Heritage Site (WHS). All of this knowledge is material which is crucial if the Highways England proposals are to have justified merit. The document we are responding to has evident weakness, as it is clearly based on inadequate and obsolete information. The only effective conduit for upwards communication of archaeological information and evaluation appears to have been through HMAG (Heritage Monitoring and Advisory Group) and Arup Atkins. Neither has thus far consulted the leading experts. In a public consultation, responses are often measured by counting: X respondents preferred option 1, Y preferred option 2. We ask that this submission not be treated in that way. In constructive spirit, we have made a collective expert group and make this submission, which we respectfully ask be considered in its own right, not just as another view, informed or not, to be counted amongst the Xs or the Ys. 1. Do you agree with the proposed option? No (i.e. the tunnel routes D061 & D062). The option for the surface road beyond the southern edge of the World Heritage Site (option F010) is the only one which does not have a severe impact on the WHS. Therefore it must be taken. The others have dreadful consequences for the world’s most famous archaeological site and its landscape setting. Option F010 is cheaper than a tunnelled route through the WHS, another reason for its being adopted. The tunnel options (D061 & D062) have major drawbacks, documented below. These could be allayed if the length of the tunnel is increased to protect much more of the WHS. a) The landscape/astronomical impact of the proposed western portal, and its approach road, on the key midwinter sunset alignment from Stonehenge. b) The destructive impact of the approach roads to the western and eastern portals within the WHS. c) The expensive and time-consuming requirement to maintain high standards of archaeological recovery, both of artefacts from plough soil and of ephemeral features from hand-trowelled subsoil surfaces, within the WHS. d) The setting of a bad precedent by allowing large-scale destructive development within a WHS. This ‘lowers the bar’ for allowing development to over-rule conservation within a WHS. It is especially bad when a more beneficial option (F010) is possible. 2. Do you agree with the proposed location of the eastern portal? Very little is known about the flanks of the Avon valley at this point. A considerable quantity of flint artefacts of the Neolithic period (the era of Stonehenge) has been collected from the King Barrow Ridge over the years: this was a favoured settlement location at that time and also in the period before (the Mesolithic). A long barrow (burial monument older than Stonehenge) and small groups of round barrows (burial monuments a little younger than Stonehenge) are close to the proposed portal. It is very likely that important, fragile archaeological deposits survive within the vicinity – deposits not yet discovered. The line of the Stonehenge Avenue, the prehistoric approach route to Stonehenge, should be preserved and reinstated by this scheme. That is good. Blick Mead is a recently discovered site here on the edge of the Avon Valley. There is concern about impacts of any groundwater reduction on deposits associated with this prehistoric site, which lies immediately next to the present A303. Blick Mead has the longest dated sequence for a settlement of Mesolithic date (the era well before the time of Stonehenge) yet found in Britain, its dates spanning the 8th–5th millennia BC. This long-term use of the area by Mesolithic hunters may explain why the Stonehenge area became a significant focus for the Neolithic people who built Stonehenge just over the ridge from Blick Mead. The D061/D062 road proposal could affect and damage this important Mesolithic site if remains survive north of the current A303 (as is known from archaeological evaluation close to Countess junction). Major modifications to the landscape have been suggested as likely to change groundwater conditions, leading to dewatering and oxidisation on the south side of the A303 where part of this site lies. Any possible effect on groundwater needs to be evaluated before any impact can be properly assessed. The proposed eastern portal will badly damage the visual setting of the prehistoric hill-fort of Vespasian's Camp and affect its extra-mural archaeological deposits. The hill-fort’s entrance faces north, so any works on the southern flank of the A303 will impinge on this, its natural access point. 3. Do you agree with the proposed location of the western portal? To understand this point, a brief astronomical mention will help. For more than a century, it has been well-known to the largest public that Stonehenge is oriented towards the north-east, the direction of the midsummer solstice sunrise. This is why tens of thousands go there each Midsummer’s Day. But new research and analysis clearly shows that the primary orientation is on the same axis, but in the other direction, towards the south-west, towards the direction of the midwinter solstice sunset. This remarkable astronomical dimension of Stonehenge is today the most widely known aspect of its singular character, the strongest basis for its world-wide fame. It is one of the most important features of the Stonehenge landscape, one which most of all must be respected and preserved. But the proposed western entrance of the tunnel lies almost exactly on this winter solstice sunset alignment! The proposed road-line west of the western portal (and within the WHS) is also broadly on this alignment. If the integrity of this south-west solstice sightline from Stonehenge is destroyed, it will forever prevent visitors to Stonehenge properly seeing the winter solstice sun setting behind the distant natural horizon – exactly as was possible in prehistoric times. This calamity would contravene Policy 3c of the 2015 WHS Management Plan: that the monuments’ astronomical alignments be maintained and enhanced to achieve a good landscape setting. The proposal will increase the area of road surface within the WHS, particularly at the western portal and to the west of it. Here, the new stretch of road would destroy important prehistoric features that formed Bronze Age field boundaries. One is probably part of a still little-understood ‘palisade’ ditch complex, dating to the Early Bronze Age (the period after Stonehenge). There seems to have been a network of enclosure around Stonehenge, and the area around the monument was in this era apparently devoid of fields, creating a cordon sanitaire around the monument. We can show a similar and fitting respect today by not having a tunnel portal and deep approach cuttings here. The entrance to this palisade ditch complex – where parallel ditches form a trackway leading in the direction of Stonehenge – is close to this projected line of the new road. Either side of the trackway are Bronze Age field systems, each a separate co-axial unit that may focus on a settlement nearby. All these features are integral to understanding later stages of the construction and subsequent use of Stonehenge. Research excavations in 2008 of an area of Bronze Age field systems north of the proposed road line revealed evidence for Mesolithic, Neolithic and Early Bronze Age activity before the fields were formed, and this is also likely to be the case among these prehistoric field remains that will be destroyed by the proposed tunnel. This south-western approach to Stonehenge was important not only during the Bronze Age, after the stones of Stonehenge were put up, but much earlier – before the age of Stonehenge. Important visual components of these are three famous barrow cemeteries, specifically the huge Neolithic long barrows at Winterbourne Stoke and Lake. Together standing sentinel over the southwestern approach to Stonehenge, they would have been significant to those occupying the intervening valley. Their prominence a full two millennia after construction – a length of time equivalent to a Roman construction being still of compelling significance to ourselves in the 21st century – is evident from the construction of a Late Bronze Age linear ditch that runs between them. There are other, vitally important examples of these singular and archaic long barrows here: another is extant to the north of the woodland known as The Diamond; a now-levelled example is in the field system close to the A360. Additionally within view is yet another, the superb and well-preserved long barrow on the southern flank of Normanton Down, with a mysterious and now-levelled ‘mortuary enclosure’ alongside. There is another at Normanton Gorse, and we understand that recent evaluation has encountered another. So we have as many as seven of these Early Neolithic long barrows across that part of the valley where the western portal would be placed. Such a grouping of long barrows in a small area is unique in the world, not just unusual. It shows that this area was out-of-the-ordinary significance during the Early Neolithic period. We can expect that the fast-evolving techniques of field archaeology will lead to major revelations here – if the monuments and their precious setting are not wrecked. Part of the point of a tunnel or new route is to re-unite the northern and southern parts of the WHS, which are split by the present surface A303 – a road so busy it is dangerous to try to cross it on foot. But the archaeology is just as important in this western area as further east. It is definitely desirable to re-unite this part of the landscape so that one could walk between the Winterbourne Stoke and Lake barrow groups. But the present proposal would only move the road a little, and leave a far larger blot on the landscape than exists at present. The approach cutting to a western portal here – deep and wide – will inflict a vast gash on the landscape. With the western portal here, this new gash is not in a peripheral or archaeology-free zone, but in one which is, in a different way, as genuinely unique, just as the famous stones are at Stonehenge itself. The portal and approach road will also be a visual blemish when seen from round barrows right along the flanks of Wilsford Down valley and including parts of the Lake and Winterbourne Stoke groups. 4. Of the two possible routes for the Winterbourne Stoke bypass which do you consider is the best route? The least damaging option for the WHS is route F010, which follows this southern route. If D062 is adopted (against our recommendations), the line of the southern route (at its east end) needs to be altered so as to avoid the deleterious impact on the landscape setting of one of Stonehenge’s two principal astronomical alignments. 5. What are the most important issues for you as we develop our proposals for the A303/A345 Countess junction? The Mesolithic site at Blick Mead, already mentioned, is exceptional and precious. In addition, round barrow cemeteries along the Avon valley to both the north and south of Amesbury show that the valley was heavily utilised during the Early Bronze Age. So we can forecast that there will be traces of archaeological activity on the valley floor. The destruction of archaeological deposits existing here has not been given adequate consideration. 6. What are the most important issues for you as we develop our proposals for the A303/A360 Longbarrow junction? Bronze Age settlement occurs around the present crossroads, and damage of any kind to the surface will require comprehensive excavation. The present lighting here already has a distracting effect on the ‘dark sky’ around Stonehenge because it makes a glowing ‘light-spot’ in the landscape as it is seen in many directions. This lighting will remain a problem if the junction is moved to the south. While it would be possible to use reduced-height lamp-posts, and full cut-off luminaires to reduce light scatter, in its proposed position this lighting would still distract from the midwinter sunset axis as seen from Stonehenge. Headlights of on-coming cars will be another source of light impacting on the solstice axis. Archaeology, like so many scientific studies, is radically changing in its methods. New technologies, such as the 3-dimensional radar method of «LIDAR», have transformed our ability to detect traces too faint for the naked eye. Old techniques of excavation and field survey have been transformed by hi-tech innovations. So our knowledge of the Stonehenge landscape has been radically changed in the last 20 years: too many new and astonishing finds to state here, they fill many recent books. The extraordinary and unique Blick Mead site (above) is a new find, and so are astonishing new aspects to Durrington Walls, a long-known site within the WHS that continues to yield new information about the Neolithic people of Stonehenge. We can anticipate that these new discoveries will continue to be made. It is dangerous to plan on the basis that what we know now of the ancient landscape is all that exists in the ancient landscape. 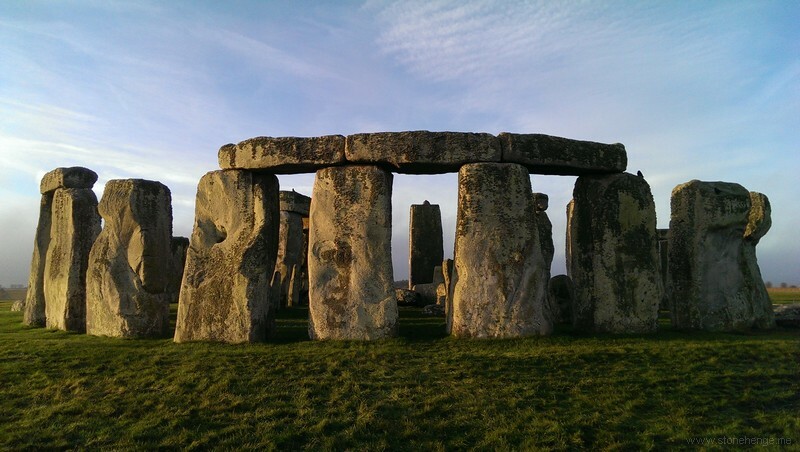 The standing stones and structures – the famous part of Stonehenge – are well over 4,000 years old. Other parts, less obvious to the untrained eye, are many centuries older. Other monuments in the WHS landscape are yet older still, by many more centuries. The Blick Mead Mesolithic site is twice as old as the stones at Stonehenge! Where planning normally deals with the short term, of decades extending perhaps into a century or so going forward, and often must notice the medium-term surviving traces such as 18th- or 19th-century or even medieval buildings, planning in the Stonehenge landscape must deal with a long term, indeed a very long term of several thousands of years. Therefore the whole tunnel option is misconceived. The option avoiding the WHS must be preferred. In the century since Stonehenge came into public ownership at the end of the First World War, there have been several big buildings put into its landscape. Each was seen as sensible at the time. Yet within as short a time as a decade (!) each was seen as a mistake, so grave a mistake it was not just regretted but demolished. So each modern structure has now disappeared from visible view. Yet the scars left, irretrievably wrecking the archaeology, will never be repaired. Here are three of them. • Immediately after the then Ministry of Works began to care for Stonehenge, it was obvious that houses for its custodial staff should be built nearby, so the stones would always have guardians close by: within 15 years, the houses were demolished as a hideous and wrong intrusion. • At much the same time, it was obvious that visitors needed refreshment and facilities, so a Stonehenge Café was built close by: again, within 15 years, the café was demolished as a hideous and wrong intrusion. • In the 1960s, it was obvious that the car-park was too small, the working buildings for custodians too small and the refreshment facilities were poor. And it was dangerous for visitors to walk across the fast and busy A344 road to reach the stones. So in 1969/70 a large car-park, semi-underground buildings, and access tunnel under the A344 were built. This was uncontroversial, an obvious improvement. Yet, within 15 years, the head of English Heritage declared their abolition to be its highest priority, and MPs called these facilities a ‘national disgrace’ which must be removed. Now they have been, leaving a wrecked area so close to Stonehenge covering several hectares. Because Stonehenge is so famous, public perceptions of it are held right across the world and are often understandably out of date. In the 1960s a widespread notion was that Stonehenge was not just astronomically aligned but was itself some kind of prehistoric computer or calculating machine to predict eclipses: this idea is still broadly held, although the evidence is strongly against it. We can see that informed and expert opinion has now decidedly shifted towards understanding that the main astronomical alignment at Stonehenge is not north-east towards the midsummer sunrise, but south-west towards the midwinter sunset (above). Yet only now are the public beginning to visit to see the midwinter sunset rather than the midsummer sunrise. We can expect it will be 20 or 30 years before that newer understanding is commonplace. Notice the time-frame it takes for mistakes to be understood: between 10 and 15 years. If a western tunnel portal is built on that midwinter solar alignment, in the early 2020s, we can forecast that it will be universally seen by the late 2030s to be another short-term disaster – one which is far bigger, has far more impact and is irreversible in a way that the disasters of the previous century were not. The wretched 10–15 year time-span from ‘sensible’ to ‘disastrous’ will have been repeated! Any proposed works on the line of the A303 will require considerable and costly archaeological excavations. These must be carried out to the standards maintained by recent research projects within the WHS. The Stonehenge Environs Project of the 1980s and the Stonehenge Riverside Project of 2004–2009 proved that much archaeological evidence for prehistoric activity around Stonehenge survives only in the plough-soil. And evidence which survives as truncated, features cut into the chalk – pits, post-holes, stake-holes and tree-holes – is mostly ephemeral, so it is not always detected by standard excavation strategies that concentrate on machine-stripping to bedrock and only cursory surface cleaning of the bedrock’s surface. Such hard-to-recognise evidence may be unwittingly destroyed without record. So the mitigation work must include arrangements for sampling and screening/sieving a suitable proportion (2%–4%) of the plough-soil prior to machine-stripping, and hand-trowelling of all machine-stripped trench surfaces to ensure recovery of all archaeological features regardless of size or visibility. This work is expensive in labour and time, especially since the proposed scheme would require the largest archaeological excavation ever undertaken within the WHS. Without shared standards within the WHS, there will be no possibility of drawing comparisons between different 21st-century excavations to evaluate and understand the character, date and extent of the more ephemeral traces of prehistoric activity around Stonehenge. Until a century ago, it was only the stones themselves which were seen to constitute precious prehistoric Stonehenge. First World War photographs show artillery field guns being hauled through the very monument – ‘safe’ as long as they did not hit the actual stones. Increasingly, we have come to understand that Stonehenge is not only the stones, not only the eroded earthworks immediately near the stones, but a whole landscape extending to the horizon in most directions and even beyond. This fact was recognized when the WHS was defined as an area extending several kilometres from Stonehenge in each direction. The integrity of the WHS was respected when new visitor provision was designed in the 2000s. Sites for a visitor centre were not sought within the WHS: the visitor centre must be on its margin, and was so built. Further access paths and roads to and from Stonehenge must not cross the WHS and interfere with its archaeology: so a scheme was devised which uses the former A344 line for access, a choice which has meant nil new impact with in the WHS. The proposal for D061/D062 is a sad and retrograde step. Instead of respecting the WHS as defining the area to be protected, it recognizes only the land which is visible from the stones themselves – a throwback to the limited ideas of 1916! It seeks to protect archaeological remains along the 2.9 km across the WHS which lies above the line of the tunnel, but cheerfully destroys everything within (and, in places, beside) the road’s footprint along a length of over 2 km – nearly as long – of the WHS. And it inflicts within the WHS two enormous and deep approach cuttings to the tunnel portals. 7) Cost and benefit: why is Highways England’s preferred option both more expensive and more damaging? We are at a loss to understand the preference for the tunnel scheme. It is more expensive than the southern surface route (option F010). It is vastly more damaging than that option avoiding the WHS. The international significance of the Stonehenge WHS should, in our view, trump a collection of middle-order concerns about effects on nationally or locally important aspects of the broader environment that were given as reasons for rejection of route F010 prior to this public consultation. The UK has an international reputation for the quality of its heritage protection and enhancement; that reputation can only be maintained – setting the bar high enough to encourage others to reject large-scale damaging developments in other WHS sites around the world – if the length of the proposed tunnel is more appropriate to the 5km-width of the WHS which the road line will traverse, or if the southern surface route is chosen.